White asparagus is the same species as the green but is grown entirely surrounded by earth which protects the slender stalk from sunlight exposure and thereby keeps it from turning green. White asparagus has long been considered a delicacy in Europe and is especially popular in Germany. It has a beautiful delicate flavour and tender texture. A white asparagus dinner (very often with Holloandaise or just melted butter) during the "Spargelzeit"- Asparagus Season will make most German jump with joy. When buying asparagus, make sure the stems are crisp and plump, and the tips are intact and firm, a slight violet tinge is normal, though considered a flaw in Germany. If you don’t intend to cook them right away, wrap them in a damp kitchen towel and store in the vegetable drawer of the refrigerator. Peel white asparagus with a sharp vegetable peeler. Trim off touch ends and discard. Fill a large pan with water halfway. Add the salt, sugar and butter and bring the water to a gentle boil. Place the peeled asparagus lying down in the pan. Turn down heat so that water is just simmering. Cover with the lid. Blanch the white asparagus 8 to 10 minutes or until al dente and drain. Dip them into a large bowl of cold water to stop further cooking. Rinse and dry the strawberries. Dice half of the strawberries. 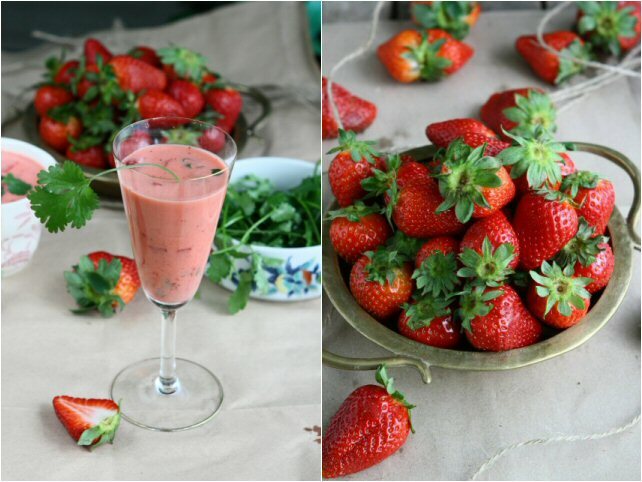 Blend together the rest of the strawberries, blood orange juice, red wine vinegar, sunflower oil and salt. Mix in diced strawberries, chopped green peppercorns and coriander leaves. Drain the white asparagus and divide them into two serving plates. Drizzle the strawberry vinaigrette over and let stand for 20 minutes before serving. wow! lovely strawberries, so red and looks juicy too! What a lovely and colorful side dish! Wow..such a simple yet delicious salad..love the picture of strawberries..
An awesome dressing idea again! A great way of using those seasonal produces! I really love the asparagus dish. Simply stunning Angie and very creative. We bought white asparagus when we were in Provence at the local market several years ago and weren't quite sure what to do with it. I'm pinning this for our next trip. The strawberries and the white asparagus are gorgeous together. A very colorful dressing and the dish is absolutely mind blowing....simple yet interesting! Very yummy, healthy n colorful salad. Looks very nice. Incredible dressing,stunning and super catchy salad. You just combined two of my favorite spring offerings. I think I can drink the dressing! White asparagus makes a rare entrance here once in a while. Shall look out for it. Thanks for all the great information about white asparagus. I've always wanted to try it. I adore green asparagus so this appeals to me! White asparagus? never seen one or tasted it. looks wonderful with the strawberries..great presentation. Yummy and absolutely tempting. What a fresh - springtime! - combination of flavors and ingredients. Simple, yet very unusual and intriguing! I haven't really dabbled much with white asparagus but it looks so perfect against that strawberry vinaigrette! This is fantastic! My mind is reeling thinking of all the wonderful things I can make with this. What beautiful asparagus, Angie and the contrast of the strawberry vinaigrette is simple yet beautiful. I love white asparagus but it's not nearly as popular in Toronto. I shall have to go on a search for this delicacy so that we can have it for lunch this weekend. What a different and beautiful idea! So much more interesting than the usual way it's served! I haven't tried white asparagus but I love the combination of flavors you put in that vinaigrette! What a great comBination, this must taste so good! what a great salad! that strawberry vinaigrette looks soooo delicious! Angie, this sounds so good! I will be in Germany later this month and hope I'm not too late for asparagus season. If I'm lucky, I'll find asparagus in a gorgeous salad like this one! I've never seen this combination of asparagus and strawberries before! I love the idea and can imagine how delicious they are together. wow this is luscious looking! We had white ones in Turkey but it is easier to find the green ones in the US, though white ones becoming more common now. I can only imagine how nice the flavor combination is. What a lovely combination! Never would have thought to combine asparagus with strawberry! And have not seen the white variety of asparagus over here! Que rica combinación las fresas le dan sabor agridulce un plato muy exquisito,hugs,hugs. I have been eating strawberries everyday now... Yummy! This looks so delicious. I don't think I have ever seen white asparagus. This looks good and has 2 of my favorite foods! I have not seen white asparagus before, they look amazing! I love the strawberry vinaigrette too, I think I could just drink it up like that lol! The unique combination of veggie and fruit here does intrigue. It makes me wish that I had planted some asparagus! Very creative and delicious side dish. Also the vinaigrette alone is a great thing to have handy in the fridge-many tasty uses for that! Enjoy the day. That makes such a pretty presentation, Angie. I love white asparagus! Stunning photos and healthy salad! 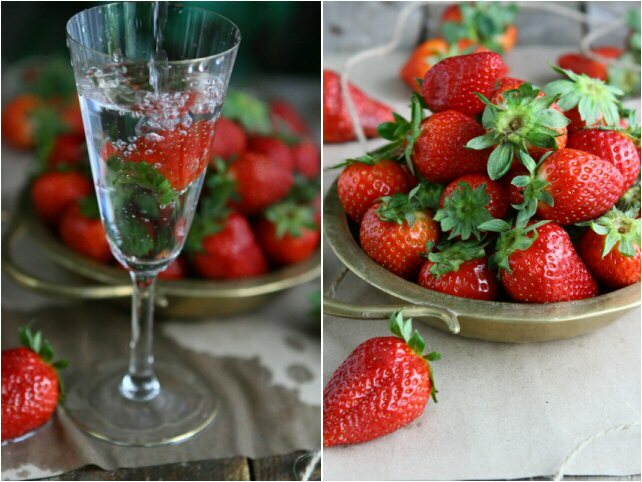 I would never thought to combine asparngus with strawberries, but in your photos they look like they were meant to be together!!! By the way, your photos are very, very nice! I wondered what the difference between white and green asparagus was! Thanks for sharing! You come up with the coolest combinations! Seriously, asparagus and strawberry?! It looks so pretty, elegant, and gourmet! Angie, this is the most wonderful recipe! Wouldn't this be the most gorgeous dish to serve at a shower or Mother's day? Your food styling always blows me away Angie. Are you a photographer by profession? The delicate strawberry sauce is such a perfectly fresh pairing with the asparagus. Looks delish! Love the color contrast :) And the strawberry looks nice and juicy ! Yummy photo as always , Angie ! I don't think I've ever come across white asparagus! This looks like a delicious way to prepare it though. Thanks for introducing me to something new, Angie! Ooh I never thought of making a strawberry vinaigrette what an excellent idea and nice contrast! this has been simply The Best year for strawberries, where I live in Nashville. Conditions were just right for a long growing season. The berries have been amazing---and I would love to make your vinaigrette using them. Excellent recipe, and the contrast with the white asparagus is beautiful. Stunning! And way too beautiful to eat even though I would love a taste of this unique combination! Great to discover your website and thanks for commenting my latest post. Asparagus are pretty popular in Denmark (my husband is Danish) and the white asparagus are a delicacy. Nice to discover a new sauce for enhancing their flavour. Wow, Angie! This is the most unusual and amazing pairing I've ever seen for a salad. 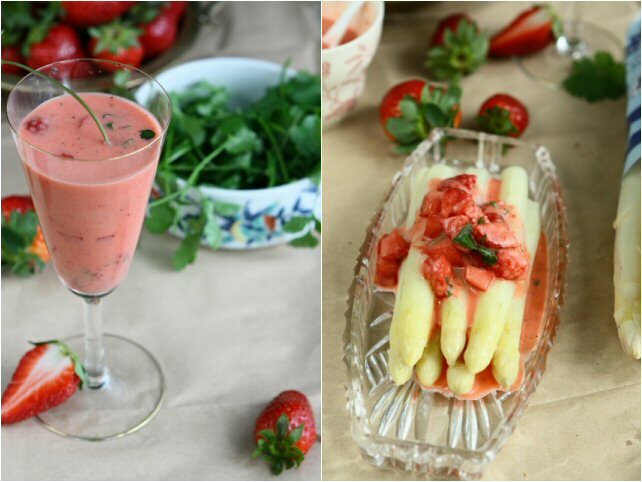 Lovely whit asparagus, and ruby red strawberries...the dressing is awesome, the photos are superb! i dont think i've seen such lovely strawberries ever here in singapore! white asparagus and strawberry does sound a little weird at first but looking at the dish, i'm convinced that it's delicious! It's really hard to find white asparagus here and if you do, it's outrageously expensive! I am going to have to splurge some day just to see how it taste. I love green asparagus, but understand that the flavors are different. Your vinaigrette looks absolutely delicious! I'm sure it would be wonderful on a variety of spring salads! Great pics! your recipes are awesome, and this is one of them! White asparagus is difficult to find here, but it's a treat when I do find it. It's so pretty with the strawberry vinaigrette! Oh, how wonderful!! Both beautiful and delicious, Angie! That's an interesting combination! Nice contrast of colors. A dish sings of spring! Amazing colors and flavours. 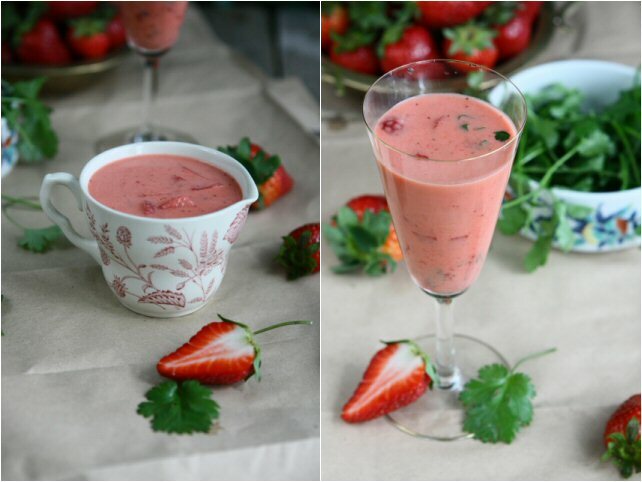 This is so refreshing with the strawberry and can't help drooling over the pics! Lovely presentation and plating...This looks like a fresh and unique dish to try. I love asparagus, and this recipe looks delicious...i do wanted to try this one day. I love white asparagus but never thought to pair them with a strawberry vinaigrette. What a great idea and itmakes for gorgeous photos. This is such a stunning salad -- I love that vinaigrette!! I haven't had white asparagus, but your delicious looking pictures are making me want it, right now! Angie, Such a perfectly beautiful salad….and so delicious looking! It would be perfect for a Mother’s Day brunch! Have a great day! Angie...what a lovely looking recipe! I've never had white asparagus but what a unique dish and a unique way to make use of those beautiful strawberries! Delicious way to serve the asparagus, looks so good and so pretty. I've seen this white asparagus in the stores, but I've never bought it. For some reason it didn't look too appealing, but your addition of colorful strawberries and vinaigrette has totally changed my mind. This really looks delicious. I assume it has the same flavor as green asparagus? What a great combination! I love the color of the vinaigrette. Your presentation is simply outstanding Angie. What a gorgeous summer fresh salad. angie, this is really interesting seeing asparagus with strawberry vinaigrette! i always like to read about the way you do dressings, they all sound so yummy! oh wow I never would have thought strawberries go well with asparagus. thanks for sharing this lovely dish! I've never heard of adding salt, sugar and butter the the pan while cooking asparagus but it sounds yummy. Your strawberry vinaigrette is beautiful and something I'm definitely going to try. I made a strawberry vinaigrette last year and LOVED it. I love the idea of drizzling it over vegetables like this. Your presentation is gorgeous. Beautiful pics, Angie! I haven't had white asparagus in a long time. Your vinaigrette sounds wonderful just by itself, too. What a great springtime pairing! I absolutely love this idea, so pretty with white and pink, and just an incredible combination! It is not easy to find fresh white asparagus here. Good contrast of white asparagus and strawberry pinkish-red vinaigrette. Strawberries and asparagus?! It makes sense. I'll try :) Colours look great.